When we think of weight training many of us envision large, bulky bodybuilders, but that’s not an entirely accurate description. Yes, when taken to its highest level, weight training can result in the familiar bodybuilder physique, but most teens who train with weights do so to improve strength and develop toned, healthy bodies – much to the relief of worried parents. True fitness requires several components, including aerobic excellence, flexibility, and strength. Weight training, also called strength training or resistance training, when performed in a safe manner, can provide teens with the tools that they need to build strong, lean bodies, giving them a great head start on their overall health and fitness. A balanced workout plan includes exercises designed to meet all parts of fitness, rather than focusing on just one segment. Aerobics, such as running, biking, or distance swimming strengthens the heart and lungs while helping muscles to utilise oxygen efficiently. Weight training strengthens muscles and increases mass by challenging them to work harder than they do during regular daily activities. Most weight training is done with either free weights, which work a group of muscles simultaneously, or weight machines, typically designed to isolate and work specific muscles individually. In addition to free weights and weight machines, the use of resistance bands is increasing in popularity, largely because they are lightweight, affordable, and easily transportable, while being quite effective in their ability to provide great strength training workouts. 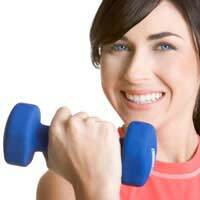 Most experts advise weight training no more than every other day, with aerobic workouts most days of the week. Additionally, coaches advise teens to focus on one area of the body each time they strength train and alternating workouts so that over the course of a week, the muscles of the entire body get some attention. For example, the first day maybe comprised of upper body work, with lower body and core being done on different days. While enthusiastic teens may be tempted to train with weights every day, it is important for muscles to rest and rebuild, so days without strength training exercises are important to the overall effectiveness of resistance training. As with all workouts, teens should spend at least 5-10 minutes warming up before training sessions and the same amount of time cooling down after. Strength training is not without risks, so parents and coaches need to be sure that teens always workout with safety in mind. Weight training, especially when free weights are used, should not be a solo endeavor. Having a spotter to stand by in case the load becomes too much, can help kids to stay safe while building muscle. Also, while teens (especially boys) may be inclined to push themselves in order to appear strong to peers, working with or through pain is a bad idea. Teens need to understand the dangers of overextending themselves since their still developing bones, joints, and tendons are at risk for injury if kids don’t heed the signals that their bodies send. Parents and coaches should also take the time to talk to teen athletes about the dangers of anabolic steroid use. These drugs are dangerous and pose dire health risks – kids must be convinced to avoid their use. Increased endurance and stamina, valuable in sports applications as well as in daily activities. Reduction in body fat, important for both short and long term health. Development of muscle mass, resulting in a lean, fit appearance. Increased ability to burn calories efficiently – even hours after a workout. Decreased chance of developing osteoporosis later in life. Improved confidence and body image.